Berwick Palace is renowned for its consistent quality in foods and services, attracting loyal patrons to experience the comfort of our dining area time and time again. We host special events like Chinese New Year or Mother’s day coupled with unique menu dishes just for the night. We have a range of dining options varying from larger group tables to smaller family and two seater tables so do not hesitate to contact us with any questions. 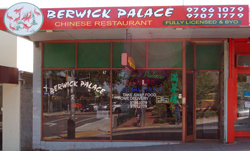 Rosana and Joe Chao would like to welcome you to Berwick Palace Chinese Restaurant and, along with our kind and diligent staff, hope you have a pleasant and enjoyable experience.